With the newest issue of Sengoku Basara Magazine just a few days away from release and the current stage play ending its run this weekend, it seems like a good time for small-scale projects to be announced. There have been a lot of great previews of the magazine courtesy of the various contributors and staff members. I liked this glimpse of Sen No Rikyuu in dog form from the Wan-Nyan Sengoku Basara manga, as well as the previews of the artwork from the Rikyuu scenario novel such as this one. I haven't been around much lately but I'll be summarising the magazine as usual once my copy arrives as usual. We're getting another pair of Sengoku Basara 4 plushies courtesy of Gift x Algernon soon, as Shibata Katsuie and Date Masamune (Hakama & Wooden Sword Ver.) are scheduled for release this autumn for ¥3,300 and ¥3,200 respectively. You can see previews of the plushies themselves at this link. Thanks go to Kaoru for bringing this to my attention! If you have been considering some of the older games and have a little spare yen on your Japanese PSN account, you may be interested in picking up some of the older games in the series. They're currently on sale at a 55% discount until 8th September 2015 as part of a promotion that Capcom has been running over the summer. The games included in the offer are Sengoku Basara Chronicle Heroes (¥900) and Sengoku Basara Battle Heroes (¥315) for PSP and PS Vita, Sengoku Basara (¥370), Sengoku Basara 2 (¥370) and Sengoku Basara 2 Eiyuu Gaiden (HEROES) (¥370) for PlayStation 3 (as PS2 Archive games). The amount of fun you can have with some of the older games makes them well worth the low cost of entry. 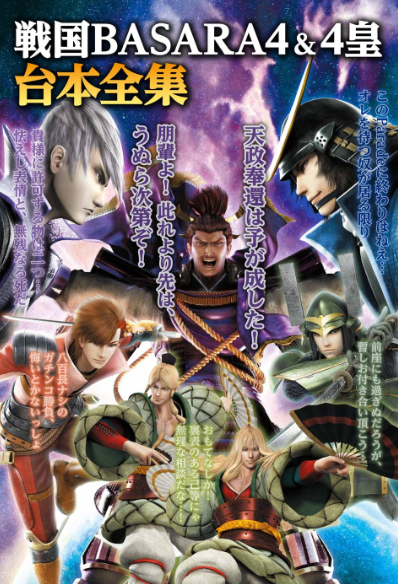 The upcoming Sengoku Basara 4 & 4 Sumeragi Script Collection book now has cover art courtesy of its updated Amazon listing. It uses existing artwork but rearranges it in a colourful way. Fans outside Japan usually have to get by with brief reports and their imaginations when it comes to the various Sengoku Basara tie-in events, so it was good to see that Capcom TV covered KobaP's visit to Nikko Edomura (Edo Wonderland) with a video. If you want to get an idea of what the historical 'theme park' is like, it gives a reasonably good idea of what to expect. There is also a little coverage of the recent tie-in exhibition in Saitama and some merchandise updates later on in the clip. Several people have asked me about how to find their codes now so I thought I'd add a quick note in case anyone else is struggling but too shy to ask. If you purchased a physical copy of Dengeki PlayStation, Weekly Famitsu or V-Jump and can't find your DLC code for the special Sengoku Basara 4 Sumeragi weapon, you need to look for a small paper packet inside the magazine. Once you unseal the packet (you can cut or tear it carefully) you'll find a list of DLC codes, including the PSN code for your special weapon. The Dengeki PlayStation code is hidden in a pink ‘envelope’ between pages 164 and 165 while the one in V-Jump can be found in the large blue section between pages 194 and 199. For some reason it was bothering me that Katsuie's was still outstanding so I'm really happy to have the full set of weapons now.